We have a variety of on-farm learning experiences available. If you are a student in high school or college and are looking for a credit internship, we’d be happy to talk to you and your advisor about creating a learning experience in sustainable living, animal husbandry, organic gardening, or other similar fields of study. Work done by an apprentice or an intern is very similar, but apprentices do not get academic credit. The focus here is on education, regardless of whether or not you are getting academic credit from a formal institution. If you’ve read our bio page, you already know that both Mike and Deborah are college professors, so they love teaching, but both also realize that sometimes the best learning experiences happen outside the classroom. The first step in acquiring an internship or apprenticeship is to read through this page and the rest of this website to make sure you want to spend time here. Then fill out the application so that we can learn more about your background and goals. If it sounds like a good fit, the next step is for you to visit us on the farm for a day, so that you can see exactly what we do. If you’ve never met a goat or a llama, it might sound like a fun idea until you come face to face with one. Spending a day on the farm will help you to decide if you really want to spend a few weeks out here. Apprentices and interns are not paid, but we do provide you with a private room, all meals, WiFi, laundry facilities, and access to our library. Hands-on learning experiences are supplemented with books to read and documentaries to watch. Who will benefit the most from an internship or apprenticeship on Antiquity Oaks? Anyone who wants to learn more about sustainable living, organic gardening, or raising livestock for personal food production (dairy, eggs, meat). Through the years we’ve hosted several people who went on to start their own farms or work on other farms, as well as aspiring homesteaders and individuals who simply wanted to know more about where their food comes from. We’ve even had a pre-vet student do an internship here for college credit. When are internships and apprenticeships available? During this time period, there will be lots of goats kidding! We’ll be attending goat births, which may mean being up at 3 a.m. when temperatures are well below freezing. Maple syrup season is late February and early March. Then we start working on the garden, mostly planting, but also harvesting a few things from the winter garden. Through the summer we will be making cheese almost daily, which means milking the goats twice a day. We will also be working in the garden, planting, weeding, and harvesting. We may also be butchering poultry during the summer. Things start to wind down in the fall as we continue harvesting the garden, milking the goats, and canning. 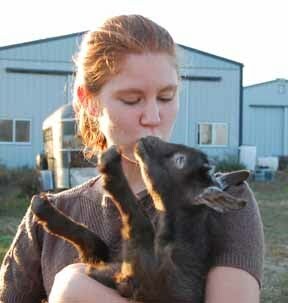 We’ll also be breeding goats to kid next year and cleaning up the garden and farm for winter. Some farms with internships have a set schedule where they do the same thing every day (such as picking and packing CSA boxes every Wednesday; farmer’s market on Thursday, etc). Since we have a diversified farm with a variety of animals, our schedule is much more unpredictable. It varies from day to day and week to week and month to month. For example, this week Mike is working on fencing and goat pens, Jonathan is cleaning out stalls in the barn and making compost, and I’m working in the garden and doing goat care. If you were here today (early April), you could choose which of those things you want to help with. Next week, I’ll have a couple of short days because I have two speaking engagements in the evening. Three goats are due to kid next week, so at some point we’ll have to drop everything to attend to them, and that could take anywhere from 30 minutes to a few hours. Somewhere in the middle of all this, I need to make five or six batches of soap. Our days will be very different next month. In the middle of summer, we’re picking berries in the woods. In August, we’re canning tomatoes. We’re always making goat cheese, but in summer, we’re making a lot more than in the middle of January. Here is a blog post written by our spring 2013 apprentice, which details her experience, including many of the things she learned. After spending three growing seasons interning and working on other farms, she came back in 2016 as our market garden partner. Is there anyone who would NOT want to apply? If you are interested in working in a concentrated animal feeding operation (a.k.a., CAFO or factory farm), then this is definitely not the right fit. If you already know the basics of gardening and want to have a 20-acre market garden, there would be other farms more suited to your needs. Although it should go without saying, we’ve had applicants who were scared of animals, and obviously everyone realized that wouldn’t work when they came out to visit for a day. If you like to watch TV every day, don’t like sweating or hard physical work, then this won’t be for you. During my three-week stay as an apprentice at Antiquity Oaks, the farm came to feel like home. There was never a moment that made me feel unwelcome, out of place, or unwanted. This environment was perfect for learning. I always felt comfortable asking a million questions, sharing my opinions, and trying new things. Not only did the Boehles teach me how to milk goats; spin wool into yarn; make mozarrella, chevre, and soap; they also shared documentaries and books full of information. I learned a lot about handling and caring for goats, sheep, llamas, cows, and turkeys. Deborah is just overflowing with knowledge. Mike showed me how to put up fencing and we worked together to build a special door in the side of the barn for the goats. I loved all the work I did. When I got up at 6:30 am to learn to milk goats, I enjoyed it. We had adventures crossing creeks, catching goats, feeding horses, and wrangling rams, just to name a few. But no matter what was going on, we almost always could laugh about it. Bottle-feeding the baby Nigerian goat, Pearl, was so heart-warming. I really fell in love with that four-legged kid! I had such a positive experience at Antiquity Oaks. I really admire the passion, knowledge, creativity, and hard work the Boehle’s pour into their beautiful farm and home. I would go back any day!